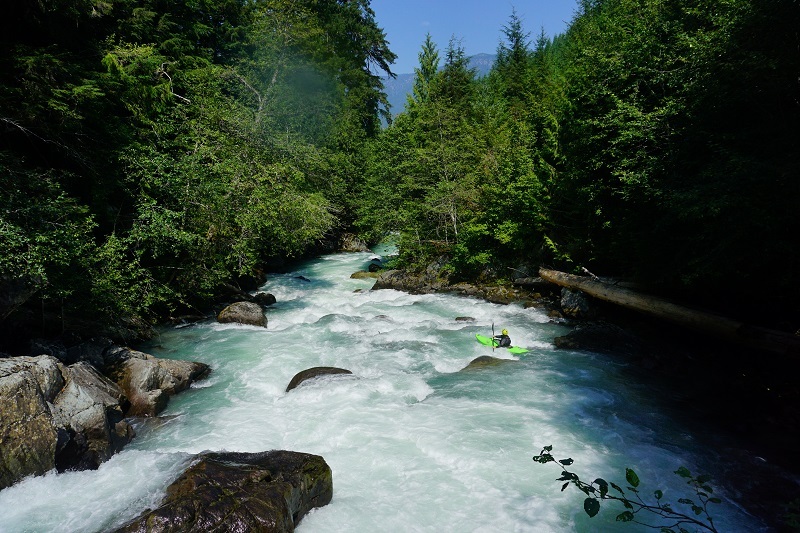 What It's Like: An obscure run near Rogers Creek with good whitewater and a short, hard to scout canyon in the middle. Scouting/Portaging: Easy to very difficult. Dealing with the canyon is a significant challenge. Level: Visual only. Possible correlation with the Upper Cheak. 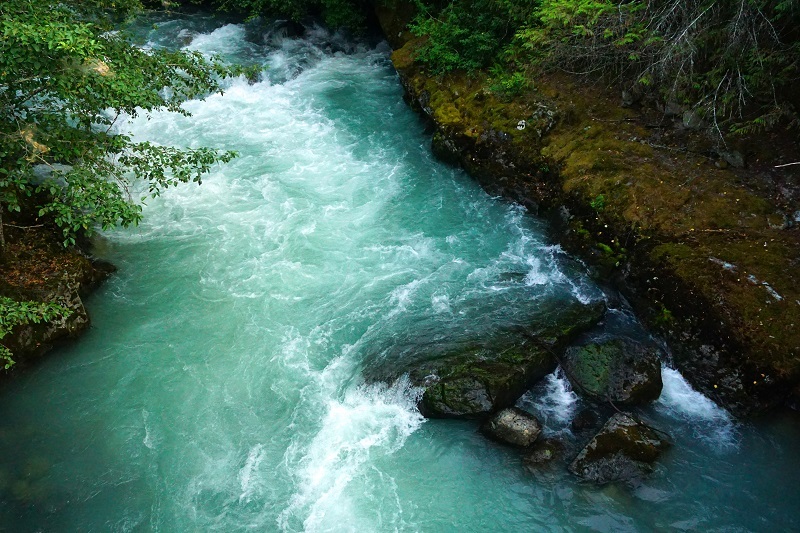 When To Go: A glacial fed river, it runs later in the season - July and August are the best bet. 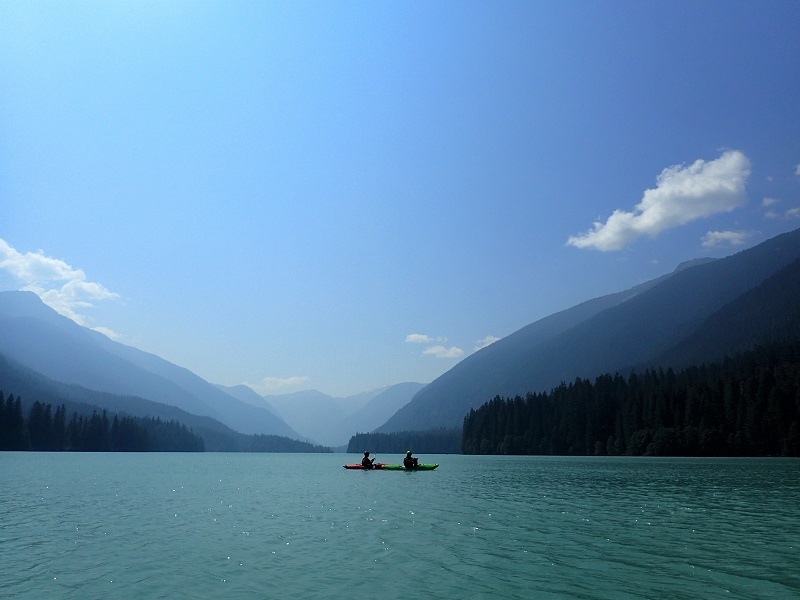 Snowcap Creek is an obscure kayak run far down Lillooet Lake, near to but farther out of the way than Rogers Creek. 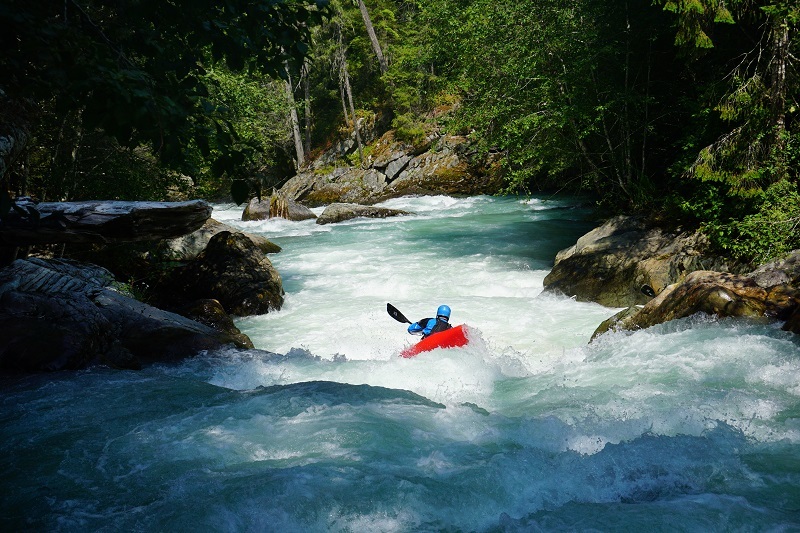 It's fed by the large glaciers in the middle of Garibaldi Park, making it a late season run with beautiful blue water and some good whitewater. There is a short but significant canyon in the heart of this run that presents a major challenge to navigation, but with careful scouting, ambition to run class V and some luck with the wood configuration it is runnable. The whole trip is a rugged, full day of adventure kayaking. The flow on Snowcap can only be measured by going out there to look. Generally, it's worth considering in July and August when Rogers Creek is in, or just too low. It might correlate with the flow on the Upper Cheak, particularly in the later part of the season when high water has ended. On two separate visits, Snowcap was at a nice medium flow when the Cheak was at ~2.40-2.45 and Rogers Creek had just run out of water for the year. If the flow is high, the canyon will get harder to run successfully. 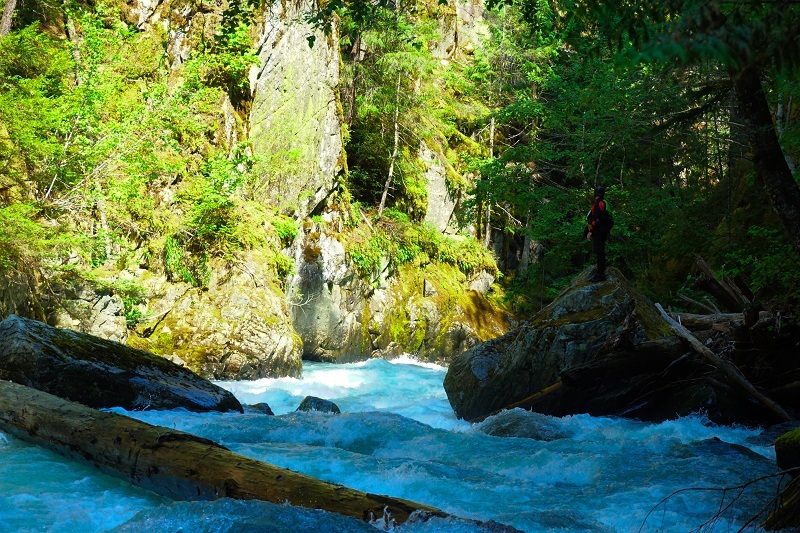 Snowcap is located across the Lillooet River from (and farther south than) Rogers Creek. Initially you head the same way as Rogers - south on the Lillooet East/In-SHUCK-ch FSR, found east of Pemberton off highway 99. About 25 km down this road, cross a large bridge to the Lillooet West FSR and continue south to the creek at the 51 km marker and use the road bridge as the take out. The put in is at Glacier Lake. Use the river right access road. Initially the road is in good shape as it passes through recent clear cuts, but it will quickly deteoriate. 4x4 and a vehicle you don't mind scratching are recommended. About 7.5 km up this road, a spur goes down to the lake near the river outflow. Glacier Lake is a wonderful put in. The river starts with some flat water, then slowly builds to nice class IV read and run with 2 larger rapids before you reach the canyon. The canyon is obvious. It's at a right bend in the river where you can't safely boat scout any further. The key to figuring out this canyon is in the scouting. First, get out on the right and scout at river level as far downstream as you can. This entrance rapid ends almost as soon as it goes around the bend. The largest rapid in the canyon is hidden around the first corner. Head high up on the right and traverse the rim, trying to gain as many views as you can. It's very steep and the bush is thick, but there are a few good vantage points. About 100 m downstream from where you started scouting there is a well definined gully you can use to get right down to water level, allowing you to scout the run out of the big rapid and the next rapids downstream. This combination of entrance scouting, rim scouting and river level scouting will allow a strong team to figure out the route through the canyon. If you end up having to portage, it takes about 30 minutes down the right side. 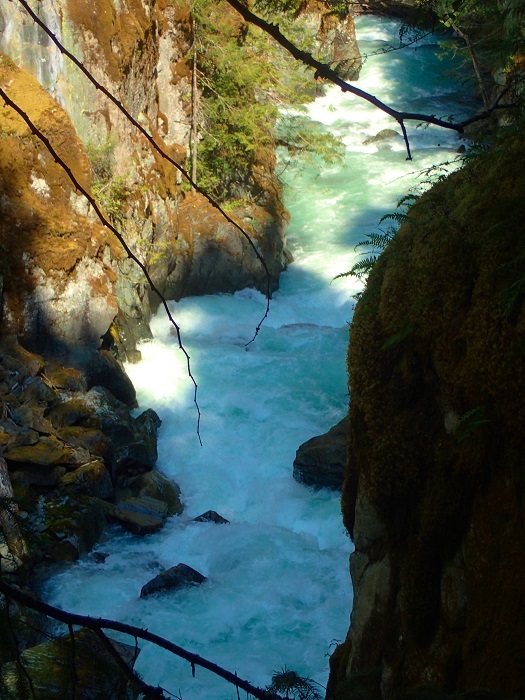 You'll need to rope your boats up, but the terrain gradually slopes down to the rivers edge below the canyon and it's relatively easy walking. It's worth noting that more than a handful of groups have been unsuccessful here. If you can't figure it out, the portage is way easier than walking out. Below the canyon are a km or two of nice class III read and run down to the take out bridge. The forest here is particularly neat. 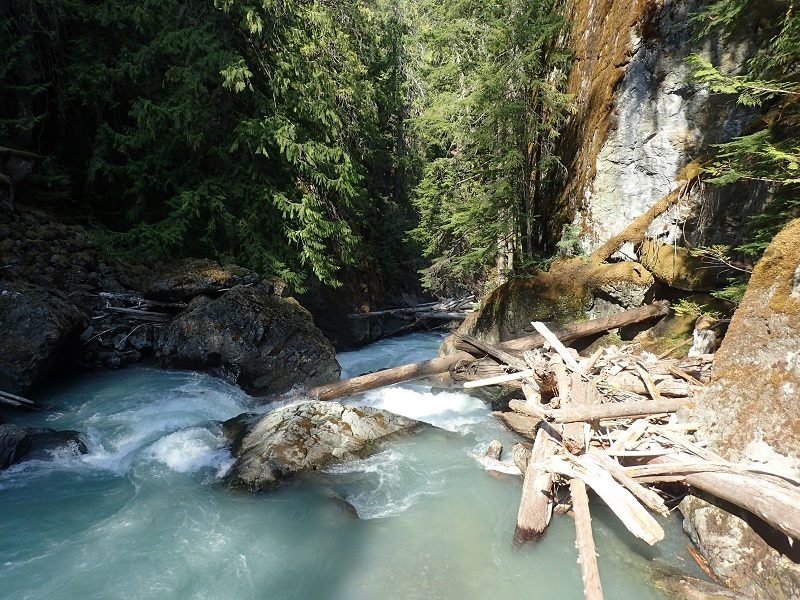 You'll probably notice the hydro gauging equipment at the take out bridge - another reminder that none of the undamed rivers of SW BC are safe from power projects. Have fun on this sweet BC adventure! Floating around on Glacier Lake, the put in. Photo Scott McBride. 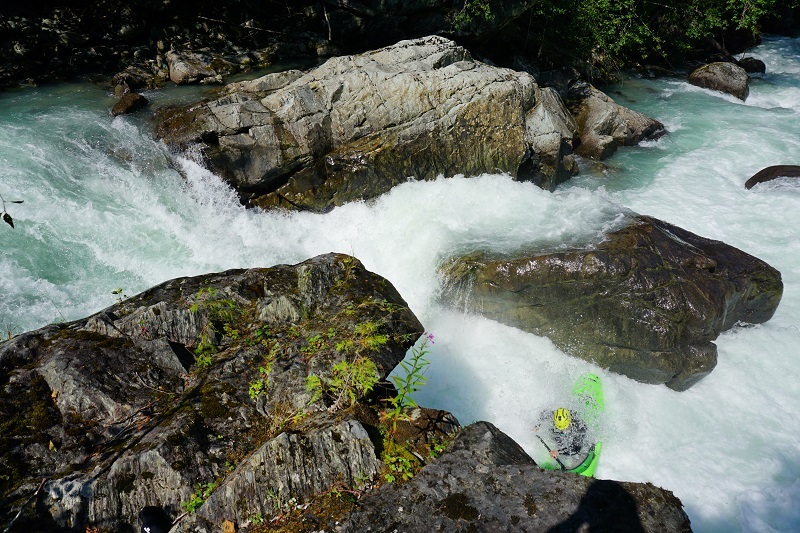 The first big rapid on Snowcap is a tight one. The other big rapid above the canyon - ramp into a hole. Scouting the entrance rapid to the Snowcap canyon. A good view of the largest class V rapid in the canyon. Photo Scott McBride. 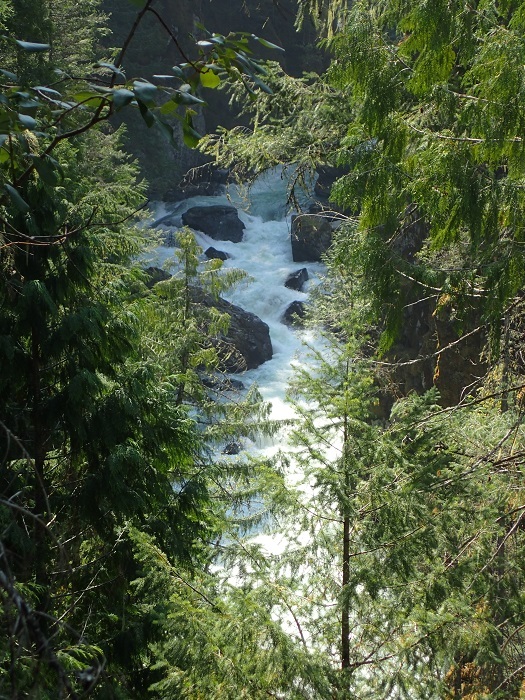 Another view of the largest canyon rapid. Photo Scott McBride. A woody double drop immediately below the big one. Photo Scott McBride. A rock outcrop upstream of the takeout bridge. This photo was taken at a medium flow.